Whether you’ve just started to grow your Instagram business profile or you made the switch yonks ago, today we’re going to be spilling the beans on how you can grow your following and squeeze the most juice out of your account. Having an Instagram Business Profile will immediately add a sense of professionalism to your account, but getting the Instagrammers of the world to pay attention to your Instagram feed posts, Instagram stories and every other element of your Business Profile will take a little bit of work and a whole lot of creative thinking. I know, I know… *cue eyeroll*… we know that we’re always yammering on about consistency on Instagram. But, it really is important to post to your Instagram feed regularly. Otherwise your followers that you start to gain will start to up and leave you! It’s also well known that every time you post something new to Instagram, your Instagram following tends to increase. 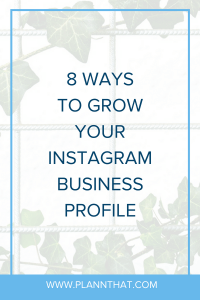 If you want to grow your Instagram Business profile you can’t skimp on consistency! PSSST -> Here are some Instagram caption ideas to keep you consistent on Instagram. Some people like to explain the purpose of Instagram Stories for business owners like ’snacks’ to your audience between their main meals of the day (your Instagram feed posts). If you are serious about making sure that you grow your Instagram business profile you should definitely dedicate some time to creating vertical content (videos and images) that you can share on Instagram Stories. If you are banging your head against the desk trying to come up with Instagram Stories ideas, here are a few that will get you on the right track. PSSST -> Did you know that you can add invisible hashtags to your Instagram Story to increase views and grow your following even faster? Watch our video tutorial right here. Everyone has seen those colourful, perfectly branded little bubbles right underneath Instagram bio descriptions… but if you have no idea what they are, allow us to be your guide! Instagram Highlight Covers are those little round bubbles that will give you the opportunity to turn your typically ‘disappearing’ content from Instagram Stories into evergreen bites of content that are organised by theme, topic, product… or any other theme-type that you can think of! If you want to learn how to create your own perfectly branded Instagram Stories Highlight covers for free with Canva, give this blog a quick read. PSST -> To create a custom highlight cover without sharing to your Instagram stories, take a look at this. Video content doesn’t have to be perfect, but it does need to be interesting! Think about what elements of your business, product, or brand story could be interesting to your Instagram audience and create video content around that concept. You can film your videos from your mobile device or if you’re feeling fancy pants, you can use a good ol’ camcorder. Need a guide to creating great social media video content? Here are our best tips for you. After a few weeks of experimenting with video content, you can take a look at your Instagram analytics (using an app like PLANN) to see whether you should continue on with your foray into the video world. PSSST -> Want the inside scoop on IGTV and long-form video content on Instagram? Read up on the essentials right here. There’s nothing more enticing to loyal brand followers than hearing the origin story of a product. Why was it created? Who by? Do your team do happy dances when they’re unpacking your new stock deliveries? Always keep a camera on hand so you can catch these priceless and oh-so candid behind-the-scenes moments because they are guaranteed to grow your Instagram business profile. If you want to increase your Instagram following and get more likes and comments on your Instagram posts you better embrace engagement strategies! But what exactly are they? What I would recommend you try out is going through the Instagram hashtags that your ideal customers are likely to be posting in, and leave genuine, thoughtful comments and like a few of their Instagram posts. Generally speaking, I’d recommend doing this for 20-30 minutes per day for best results. If you really want to grow your Instagram business profile one of the fastest ways to do so is by collaborating with other brands on Instagram. Perhaps they have complimentary products (if you sell haircare, you might pair up with a makeup brand) or a similar target audience (you’re a destination hotel, and they’re a destination café). Whichever brands you choose to collaborate with, the key is to make sure that the content that you create together works for both of your Instagram accounts. You could even lower the cost of Influencer Marketing for your brand by doing a dual campaign with another brand and splitting the costs! if you want to grow your Instagram business profile, try giving Instagram Advertising a try. If you can manage it we’d recommend giving Instagram Stories ads a try as they can be a little bit more candid and are great if you have a low advertising budget. Also, if you’d like to start scheduling your Instagram posts and stories from a desktop or laptop, make sure to put your name down for our Plann desktop waitlist and get yourself in the draw to win Plann free for life!